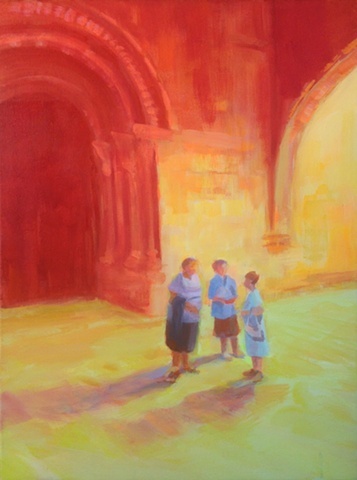 Three women are chatting outside the cathedral after mass in the old Gothic village section of Tudela, Navarra, Spain. It was a unique scene for me to capture because I rarely focus on figures in a landscape. This scene is repeated in other paintings that now create a series. Each painting has different qualities and are unique but all of them evoke the same essence of that particular moment. There is also some historical quality to this moment inherent in each of these paintings. As an aside, the three ladies may not be sisters; Tres Hermanas was the name of our coastal villa in Comillas, Cantabria, northern Spain.